The Ester Polyester Film Type EU is a Bi-axially oriented transparent polyester film that offers a better protection against ultraviolet light for products in transparent packaging. This dual surface polyester film offers appropriate absorption of UV radiations and good weathering resistance. 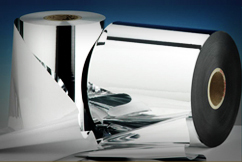 The UV resistant film protects the product (especially those which are sensitive to ultraviolet radiations) against damages from light and also contribute towards a significant amount of cost reduction in form of ink usage which were earlier used to achieve the same results. Good frictional and optical performance. Packaging of various food products like meat, cheese and other UV sensitive products. Useful as UV and weather resistant film for outdoor applications.